This bright little annual, P. grandiflora, has been introduced many years from its native home in Chili, and few Chilian plants have spread so widely all over the world. It seems as happy under a tropical sun as in an English garden, where no other annual excels it in brilliancy, delicacy, and diversity of color. It is at home as well on a dry, poor bank as in a rich border among taller things. One can see by its growth that it is a child of the sun, and that is why one finds it so fine in gardens in the parched plains of India and Egypt, as well as throughout N. America. The colors vary from crimson and white through every shade to pure yellow. 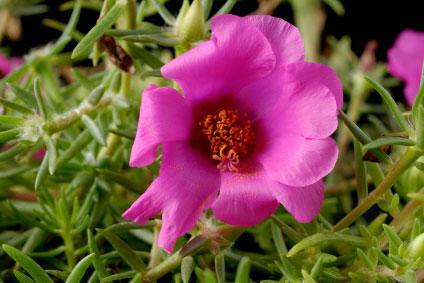 Seeds of the Portulaca should be sown thinly during the month of April in pans in a frame, and the seedlings be planted out early in June. They can be also sown in the open ground in May. The best plants are got when the seedlings, as soon as they are large enough to handle, are pricked out into small pots of rich soil and kept in an airy frame. The seed is best sown in light soil, and only just covered. In planting out, choose the sunniest and warmest spots in the garden.